Red Chawli Leaves recipes | Amaranth Leaves recipes. Red Chawli leaves (Amaranth leaves) is a popular leafy vegetable grown all over India. They are found all around the year with peak season being Summer. We have used the healthy red chawli leaves in making Quinoa red chawli leaves khakhra recipe. Made with 3 super flours, quinoa flour, oats flour and whole wheat flour (gehun ka atta) which makes it a super healthy snack with the additon of red chawli leaves. 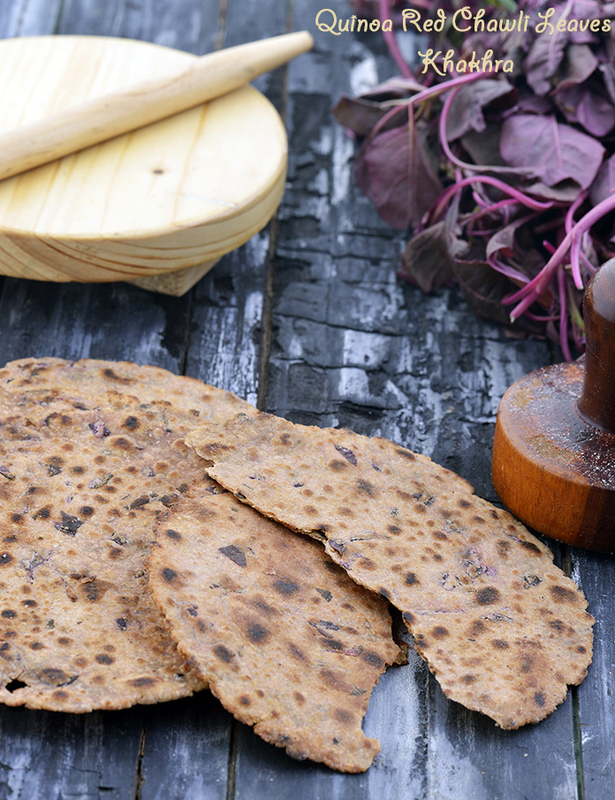 Red Chawli Leaves, Amaranth Leaves : It helps reduce the bad cholesterol (LDL) from the body. Moreover it also has small amounts of potassium and magnesium, the two nutrients which maintains heart health. Chawli Leaves Good for Anaemia. With a whooping amount of 32.2% of Vitamin A, chawli leaves can in truth work towards improving vision. It’s the fiber found in amaranth leaves which is good for the gut and constipation. See detailed benefits of chawli leaves. Enjoy our Red Chawli Leaves recipes | Amaranth Leaves recipes below. This wholesome recipe can be prepared with any or many dals as per you choice, such as masoor, tuvar, etc. Savour hot with rice and ghee.